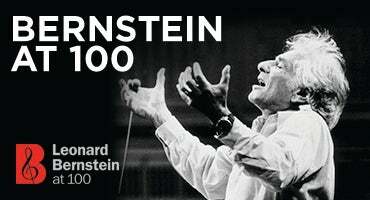 If any single performance could encompass the breadth of Bernstein’s genius, this selection of works does. The audience is taken on a breathtaking ride through the joyful celebration of the Chichester Psalms, the darkly intricate beauty of the Serenade, featuring Grammy-nominated violinist Robert McDuffie, the transporting Symphonic Dances from West Side Story, and the knife-edge jazz of Prelude, Fugue and Riffs, written for Benny Goodman and performed here by award-winning clarinetist Jon Manasse, with Todd Rosenlieb Dance performing Rosenlieb’s original choreography. Bernstein’s daughter Jamie will host this spectacular celebration and speak of her father’s legacy. 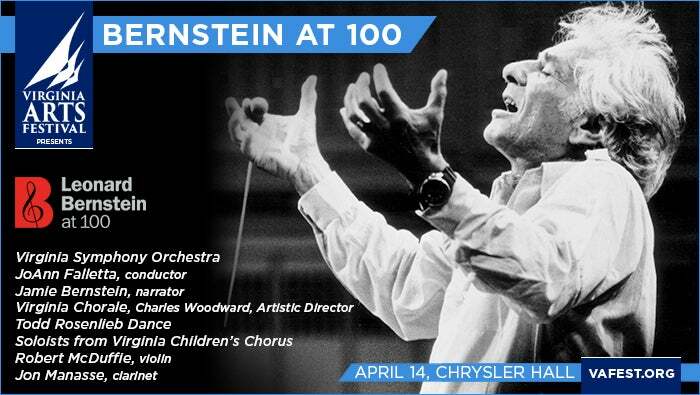 Leonard Bernstein at 100 is the worldwide celebration of the 100th birthday of composer, conductor, educator, musician, cultural ambassador and humanitarian Leonard Bernstein. Virginia Arts Festival is pleased to join hundreds of arts institutions and ensembles around the world in celebrating the contributions of this seminal artist. The Festival will partner with two artists who share deep connections with Leonard Bernstein: Virginia Symphony Orchestra Music Director JoAnn Falletta, who studied under Bernstein, and Rob Fisher, the award-winning music director who has led Bernstein shows on Broadway and most recently kicked off the Leonard Bernstein at 100 worldwide celebrations with a Bernstein on Broadway tribute concert at the John F. Kennedy Center for the Performing Arts.